A house is only as good as its foundation. Built solid and strong, the resulting structure should last for decades. NASA is laying a strong foundation of life science research with results from a recent investigation on the International Space Station called BRIC-19. The Biological Research in Canisters (BRIC) series of investigations encapsulates samples inside rectangular containers about the size of shoeboxes. BRIC-19 launched on the fourth SpaceX cargo resupply services mission in September 2014, carrying Arabidopsis thaliana seedlings. The plant—more commonly known as thale cress—germinated and spent weeks growing in petri dishes in BRIC-19 before returning to Earth in a Dragon capsule Oct. 25 for examination by scientists. Thale cress is a model organism. These are plants, microbes or animals that are studied and have a genetic makeup scientists understand. Researchers compare structure and development of organisms exposed to microgravity with what is already known about them. Besides the potential benefits to future astronauts, BRIC-19 may also provide insight into basic plant growth. On Earth, gravity affects the way plants and animals grow. Removing that variable can teach us about how living things develop. "We have been trying to address how plants respond to the stresses and strains of their own growth" said Simon Gilroy, Ph.D., principal investigator for BRIC-19. "How they sense their own weight and lay down strengthening tissues to combat these forces. We needed to remove gravity and watch how the plants develop, making the weightless environment of the space station the only laboratory where we can do this work." In microgravity, growth and development alter, revealing fundamental processes. Scientists will investigate the differences in development in space and on Earth and how this might be used to tailor plant growth to thrive in space. Understanding how plants grow at a genetic level could improve biomass production on Earth. "From our previous work on gravity and touch sensing, we think we pinpointed a gene that is a master regulator of this process, and engineered mutants where it is either always activated or always off," Gilroy said. "These are the plants we put into space and we are really excited to see whether the plant that has its mechanical response system engineered to be 'always on' grows more like a plant on Earth." BRIC-19 is one of the first to be part of GeneLab, an open, innovative approach to doing science. GeneLab is a collection of life science investigations designed to produce results that will benefit people living and working in space as well as those on Earth and improve the health of the environment. Through GeneLab, NASA is creating a database where scientists around the world can contribute information and retrieve data from other investigations that could assist in their own studies. "GeneLab is a collaborative tool, a new research model enabling a variety of scientific developments," said Marshall Porterfield, director of Space Life and Physical Sciences at NASA Headquarters in Washington. "The database will take advantage of research technologies to create a comprehensive and open source of scientific data comparing life in space to life on Earth." Studies on the orbiting laboratory, such as BRIC-19, will generate enormous amounts of raw data. All possible biological molecules—DNA, RNA, protein and metabolites—will be extracted from microbes, tissues and organisms at several points during space missions. 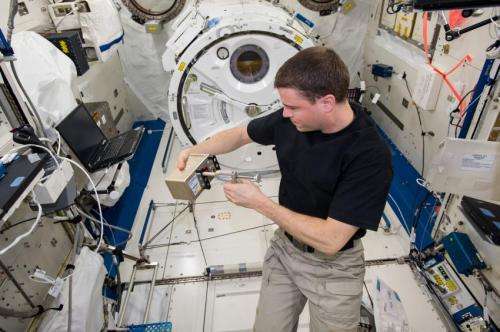 The raw data will come from mapping the complete genes of the tissues flown in space. The data will be uploaded into a universally available life sciences database that will contain the integrated gene and biomolecular "maps" for the tissues and organisms that have flown aboard the station. As with constructing any kind of strong, complex facility—mortaring each carefully laid brick—building this database will take time. With the help of investigations such as BRIC-19, the end result will be a monument to science to assist in pioneering breakthroughs for years to come.